Sometimes we hear Little Rock motorists say, “What’s up with all this maintenance stuff? Modern cars just don’t break down.” While it is true that today’s cars and trucks are extremely reliable, they are also becoming increasingly complicated and use more exotic materials than ever before. All that complexity demands higher tolerances for everything. For example, most Little Rock car owners don’t realize how high tech automotive fluids have become. Fluids like, engine oil, transmission fluid, coolant and brake fluid. Did you know that a modern engine would not run for more than a few months using motor oil formulas from 30 years ago? Today’s automotive fluids contain a much higher percentage of additives to protect your vehicle’s components from premature wear and corrosion. Time and miles march on for all of our cars. Please don’t think we’re using scare tactics to get you to take care of your maintenance – but here are some personal stories from AutoNetTV staff members to emphasize and show how essential it is to get things done when they are due. Names are withheld to avoid embarrassment to those who should know better. Even though they should know better, it usually comes down to real life: time and bucks. But they are tales of a stitch in time saves nine. The first comes from a staffer who bought a used pick-up truck for his son. The oil was clean and all the fluids were topped off. A short time later, the truck overheated on a highway in Arkansas and shut down. The repair shop diagnosed the problem: the radiator pan was corroded and dumped the coolant. Even though the coolant level was correct, it was clear that the coolant had never been completely replaced – just topped off from time to time. While this kept the engine cool, all of the anti-corrosion additives had worn out; the coolant became acidic and ate through the radiator pan. The cost: hundred of dollars and four days in the shop. This demonstrates the need to get your coolant exchanged on schedule. Another story involves the true cost of skipping an annual inspection. Our staffer took his SUV in for the Arkansas safety inspection to renew his registration. At the Little Rock inspection station, he learned that the law had changed and that his newer rig only required an inspection every two years. He was very happy to save the money. The problem was, his rear brake pads were very worn. Two months later, it was bad enough that he could hear the grind – over the radio, DVD player and the kids. He took it in to get the bad news. Both of the rear brake rotors were damaged. The left one could be resurfaced. The right had to be replaced. So saving a little money on his safety inspection turned into an extra $500 over what brake pad replacement would have been. Moral of the story for Little Rock car owners: don’t skip your essential annual inspections. The irony is that many Little Rock service centers would have done a brake inspection for free. Situation: son and wife with cars from the same auto maker with essentially the same engine. Our staffer checked the son’s maintenance schedule and saw that it needed a timing belt replacement at 90,000 miles/145,000 km. He had it done – it cost several hundred dollars. His wife’s car had about 60,000 miles/97,000 km, so it should be ok for a while. Right? Wrong. The problem was that the wife had the turbo charged version. Its belt was scheduled for replacement at 60,000 mi/97,000 km. At 63,000 mi./101,000 km, the belt snapped on the interstate. The valves all crashed down into the cylinders at high speed and the entire head was shredded and had to be replaced. The cost: several thousand dollars. Does he wish he had checked the auto maker’s maintenance schedule? You bet he does – every time he passes a big-screen TV. The team at Parkway Automotive in Little Rock recommends taking care of little things before they become big things. And when you take care of the little things, you can make your car run better and is more economical to operate in Arkansas. Remember to save those maintenance records. It’ll show potential buyers that you’ve taken care of your vehicle and it will help you get a better price. Or when you buy a used car, check those records. If there aren’t any, assume that the maintenance hasn’t been done and take it to your Bryant, Arkansas or Ferndale, Arkansas service center or Parkway Automotive in Little Rock for an inspection. Take care of unperformed critical routine maintenance sooner rather than later. Getting New Tires In Little Rock? There are so many tire choices in the Little Rock, Bryant, Arkansas, and Ferndale, Arkansas area, selecting the right one can be a bit overwhelming for Conway, Arkansas car owners. 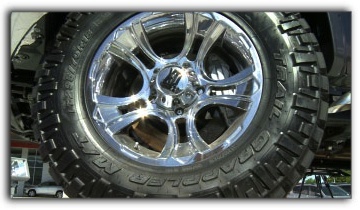 And even though it’s kind of fun to have new tires on your truck, they’re a significant investment for most Conway, Arkansas folks so you want do it right. Tip: talk with your honest Parkway Automotive tire professional. He’ll help you sort through the choices. Here are some of the critical issues you’ll talk about: One is size – you know, all those numbers on the side of the tire. The right size is key. All new vehicles are required to have stability control which, along with other important safety systems, is calibrated to work with specific tire sizes. Your Little Rock tire professional can help stay within auto manufacturers’ specifications or program a different tire size into your truck’s computer. And you’ll want to discuss how and where you drive in Conway, Arkansas to determine the type of tire you need: summer, winter, all season tires or all-terrain. There are tires for every Little Rock auto owner’s needs. Like we said, tires are a big investment, so you want to get a good value on tires. Now that doesn’t always mean the cheapest tire. A top tier tire from Parkway Automotive will last a long time and give Little Rock drivers good performance throughout its life. Tires sold in Little Rock bargain tire shops may not live up to that promise. Again, your honest Parkway Automotive tire professional can give you options that offer the best long-term value within your immediate budget. Last, with a 2-wheel drive vehicle, it’s essential to always replace both tires on an axle. Modern sensors and computer safety systems for truck brakes, stability and traction control need both tires to have the same amount of wear to work properly. And always put the new tires on the rear so you don’t fishtail in a turn. With all-wheel drive you should replace all four tires at the same time. Schedule a tire inspection at Parkway Automotive to see how much life is left in your truck tires and seek the help of a professional when choosing new shoes for your vehicle. So it’s critical to keep your fuel injectors clean. That starts with keeping the fuel in your tank clean. High-quality fuel contains detergents and additives that help clean your engine. Brand-name Arkansas fuel companies also deliver a more consistent quality of fuel than do bargain stations in the Conway, Arkansas area. Check your owner’s manual or Parkway Automotive in Little Rock to find out how often you should change your fuel filter. This should be part of your regular preventive maintenance. Also, remember that if you use bargain-brand or low-grade fuels, or if you drive an older vehicle, your filter will need to be changed more often. If your fuel injectors are gummed up, you can get a professional deep cleaning service at Parkway Automotive in Little Rock that will result in better gas mileage and improved vehicle performance.